As I mentioned in a previous post, my Project Study class is assigned a web project. One of our concerns will be: what makes for a website successful? I have compiled a list of web sites for my students to team up and analyze. Below are the questions I posed to them and the list of sites they are to visit. What do you think about any or all of them? Method: Each team will be given one site to review for the class. They will post a comment and also present their views to the class. They may not all agree but that's okay, it makes for better dialogue. Can you guess who their target audience is? When you are on the site, is the "brand story" immediately clear? Does the site do one or more of these things? Entertain, Inform, Sell. Is here a reason to return to the site? IF YOUR NOT IN THE CLASS FEEL FREE TO PARTICIPATE! Post a comment addressing the questions listed above or add your own points. Or post a link to a website you think is great and tell us why. Let's discuss what makes a web design great. -The purpose of their site is to sell jeans. -It is Branded well with design elements. Was unsure what they were selling at first. -Site really wasn’t aimed towards us so we didn’t really feel an emotional response. For who it was aimed at would feel love. -Audience is 25-35 years old w/money to spend on clothing. Probably live in or near a cold area. European? -We did not know what they were selling on the site at first. They were aiming to sell jeans and informing you where to buy them at. -We found the site to be very difficult to navigate. -We had no reason to return to the site since the jeans were out of our price range. The purpose of the site is to review and feature books that are noteworthy for their design on the author’s blog. It has a cohesive look and feel throughout the site, the branding is fairly strong. It’s inviting to designers, probably younger but gender neutral. When you are on the site, is the “brand story” immediately clear? The site does all three things, though it emphasizes entertainment and information on books the author reviews; links to the actual books are featured on the sidebar so that the audience my purchase the books if they are interested as well. The layout is narrow, simplistic and list-like—you simply scroll down and click on a category or specific entry. Yes, as a blog it will be constantly updating, therefore the content has potential to be fresh and new, constantly changing. 1. The purpose of this site is to promote comedian Andrew Maxwell, and keep his fans up to date on his whereabouts. 2. The site is not well branded at all, when first visiting the site it has the feeling of perhaps what a New York Times Newspaper site would be. Only once reading and exploring the site do you realize what its purpose is. 3. Our emotional response to this site is frustration and irritation. 4. The target audience of this site is young adults. 5. The brand story is not very clear. The site resembles a newspaper to much in the idea that there is as much information in one place as possible. Young adults are more interested in being entertained, we don’t want to read. 6. The site is mainly to inform than to entertain. 7. The site is easy to navigate but extremely irritating. 8. We have no desire to ever return to this site. 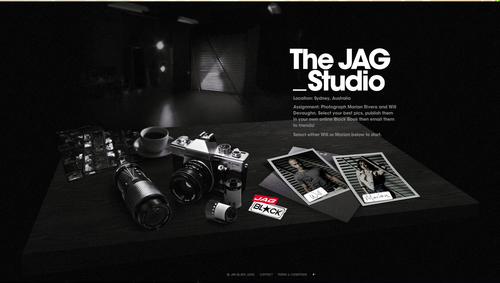 The purpose of Jag Jeans is to sell and promote their clothing line via interactive media. We feel the site is misleading and unclear in reference to a selling identity. The emotional response is lacking and sterile, again leaving the viewer guessing. The target market is very evident to those of the modern youth demographic. The brand story is left behind and the brand showcase is minimal, loose to interpretation. This site is entertaining and has the elements of promotional sales. The website is easy to navigate due to lacking options. We feel the site is returnable if one is into fashion photography and laying out fashion magazine spreads, their approach is unique and entertaining. The only factor of viewer revisit is upon their interactive media opposed to their actual product.